an Android app, and a mobile website. Once we recognize the need to provide our audiences with content optimized for their mobile devices, we are immediately presented with the question of how will we deliver that content. 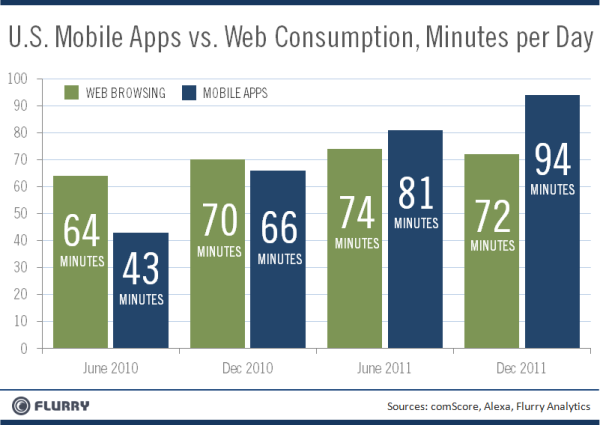 Should we use a mobile website, mobile apps, or both? From a technological standpoint, mobile websites may be accessed through the web browser on any mobile device. This means that your patrons can experience your content in an optimized format regardless of whether they use a Blackberry, an iPhone, an Android, or any other smartphone or tablet computer. So, question answered, right? Obviously, a mobile website is the best choice. To be blunt, smartphone culture is app culture. As I mentioned in part I of this series, mobile research company Flurry Analytics released a report at the end of 2011 based on public data which found that Americans spend an average of 94 minutes per day using mobile apps vs. 72 minutes per day browsing the web – this includes mobile web browsing combined with desktop web browsing. 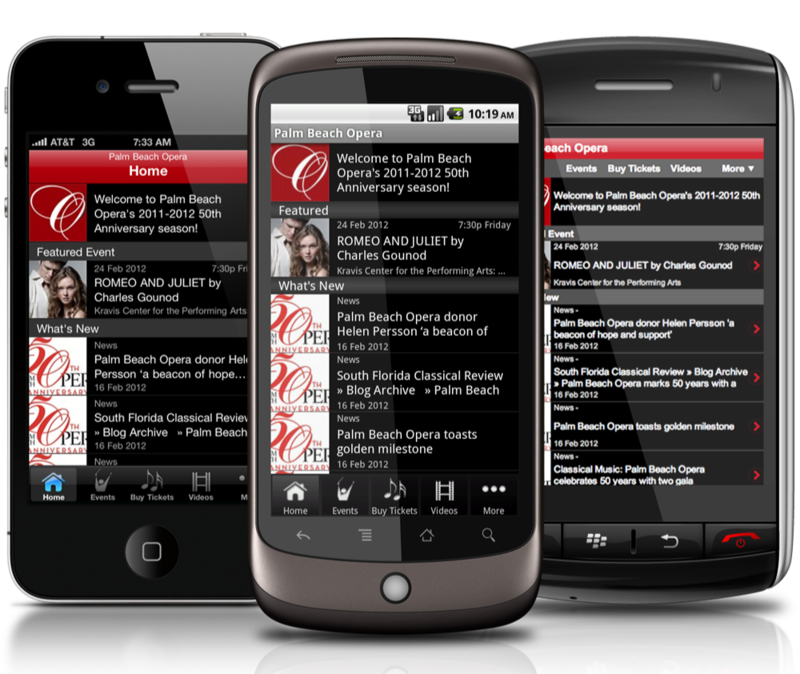 Smartphone owners use their mobile web browser to search for information, but they use mobile apps for ongoing interaction. This is what lies at the heart of deciding how you will deliver mobile content to your audience. Do you want audience members to find optimized content when they perform an internet search on their mobile devices? If so, then you need a mobile website. Do you want to provide mobile users with access to your content regardless of the type of device they use? If so, then you need a mobile website. Do you want mobile users to engage repeatedly with your content? If so, then you need to use mobile apps. Do you want mobile users to engage more deeply with your content than an information search? If so, then you need to use mobile apps. If you want to achieve all of these things, then your mobile strategy must include a mobile website AND mobile apps. As you may know, mobile apps are particular to the device. iPhone apps do not work on Android devices; Android apps do not work on Blackberry devices; etc. So, how do you decide which mobile apps to pursue? 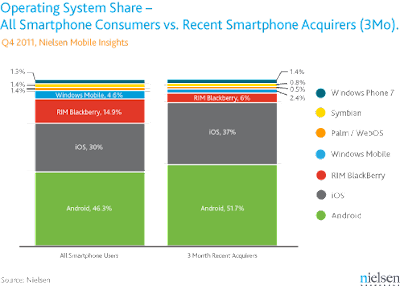 According to the Nielsen Company’s 2011 year-end report, over 46% of all smartphone users have Android devices and 30% of smartphone users have iOS (Apple) devices. 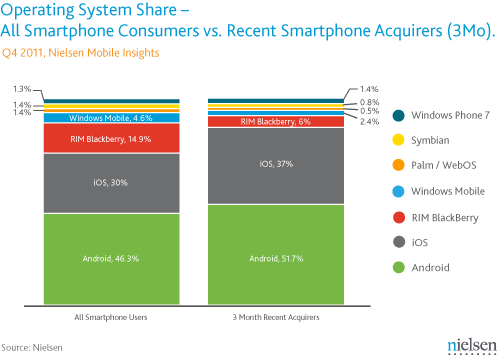 And if the smartphone sales for the last three months of 2011 are indicative of the future, then Android and Apple will gain an even stronger hold on the smartphone market. So the bottom line is this: a comprehensive mobile strategy should include a mobile website, an Android app, and an iPhone app. While the mobile website will provide universal access to your content for ALL smartphone users, the iPhone and Android apps will provide nearly 80% of smartphone users with mobile content in a format that they prefer to use. At InstantEncore, we believe in providing performing artists and organizations with the tools that they need to implement a comprehensive mobile strategy without charging an exorbitant fee. To learn more about the pricing and features of our comprehensive 3-in-1 mobile solution, visit www.instantencore.com. Engaging Mobile Audiences - Part I: Do You Have To?